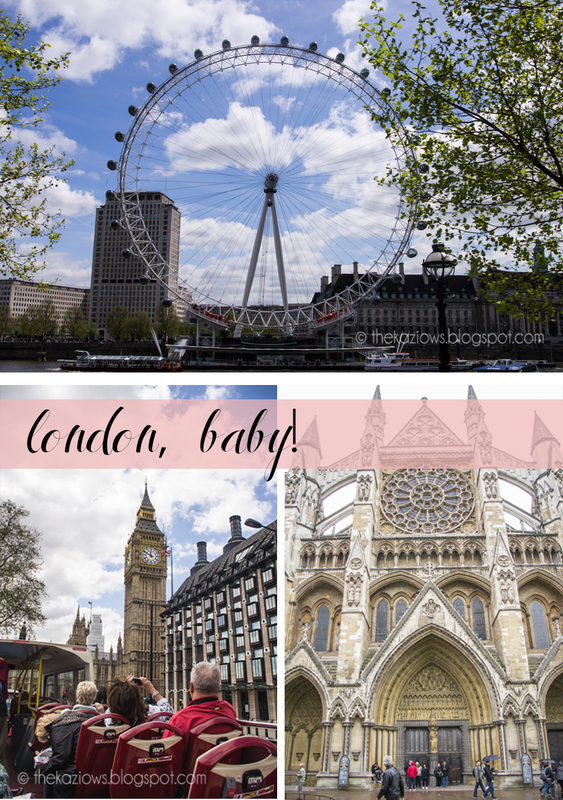 I feel like I should apologize in advance for how long this post is, but at the same time I don't want to apologize at all because London is Awesome! That's right- 'awesome' with capital A! I sort of want to apologize for only showing you a few of the highlights. Seriously, this is such a fun city! If you get the chance- GO! Union Jacks & dudes in kilts?! London's streets are great for window shopping and people watching! We only had three days in London. WAHHHH!!! It was not enough. Not.At.All. In three days, you can see the highlights (quickly) but not much else. I want to go back and explore more of the history and more of the "off the beaten path" places. I might have to move to London for a bit to get to do everything I want to do there. Ahem. Some of the more popular sights. This was our last stop on our vacation with my mom - hi, mom! - and probably the part she was most excited about. One of the things she really wanted to do was a hop-on / hop-off bus tour. Confession: I thought that was going to be totally lame and completely touristy. I was so wrong. I could not have been more wrong. It was tons of fun! Ok, it was a bit touristy but using that bus system to get around the city was fantastic. The tour guides were really funny and interesting and we learned a lot that we probably wouldn't have learned any other way. Also, it was easy. And that's not to be undervalued when you're going to a city the size of London. The bus tours take you to all of the major sights. Yay! I would absolutely do another bus tour. St. Pauls Cathedral- the seat of the Church of England- and views from the top. I love to visit churches. You've probably noticed that already. I like seeing firsthand the architecture I used to study in books in college. I love how every country has it's own take on each major architectural movement. It's fun for me to see how different religions depict their holy stories. I'm intrigued by how different peoples, even if they subscribe to the same religion or denomination, worship. They are all so unique. St. Paul's is one of the more interesting churches we've visited. If you like history, you probably already know a bit about this church and the Church of England. It's pretty cool to get to see it for yourself. Also if you're interested in history, tons of people are buried here - Alexander Fleming, Christopher Wren, Anne Herbert - and you can read their tombs in English. That's something else not to be underestimated. England does not, however, allow photography inside their churches. I have a love/hate relationship with this rule. The Tower Bridge was decorated for the Queen's Jubilee while we were there and I thought it was rather fun. I overheard several people saying they thought it was gaudy and ugly but I didn't think so at all. I thought it was a great blend of old and new... just like pretty much all of London. On my next trip, I've got to get a night shot of this bridge. What was I thinking??? It was freezing on the bridge. Mom didn't walk out there with us. And, yes, that's how my hair looked the whole time we were in London. Rain is not my beauty friend. London Calling? He had way more fun in London than he thought he would. Have I mentioned yet how FUN London is?!? The Brits do such a fantastic job of mixing history and sarcasm and modern and humor. No one does it better. Seriously, no one. You're just going to have to see it for yourself to really get it. I thought The Tower of London was worth a cursory stop. I mean, it's got some rather significant history dating back to William the Conqueror and is pretty important to the Royal Family, right? This turned out to be one of the cooler places we visited. So many fun and interesting museums and displays to check out! We got to see changing of the guards (we didn't do that at Buckingham- not enough time), the Crown Jewels, and a museum dedicated to war armor. They even have displays of animals made out of concrete and what appeared to be chicken wire all along the menagerie. Yeah, it was really easy to imagine one of the Boleyn girls walking along those casements or someone being brought as a prisoner by boat to the Traitors Gate. Awesome stuff. I should probably be more embarrassed by this than I actually am, but I loved The Eye. I think it might have been my favorite part. (To be fair, I didn't get to go to the Sherlock Holmes Museum- I'm telling ya- three days is not enough!) I just kept going back to it and looking at it. I think I saw it at least twice every day we were there. Fortunately, we stayed at a hotel in Covent Garden and it was only about a 10 minute walk away. Riding The London Eye and mom chillaxing. Mom didn't want to ride the Eye. No idea why. She missed out. Maybe she doesn't like huge ferris wheels as much as I do. Or maybe she was exhausted by this point. Or maybe she just thought it would be easier if someone sat with our luggage since our flight was leaving only a couple of hours later. This is terribly unpopular of me, but I liked Westminster more than St. Pauls. I think everyone I've spoken to who has been to London likes St. Pauls more, but not me. Westminster is just so pretty and peaceful inside. I could have spent all day there. But, again, no photography inside. And, of course, my night shots. I love how cities come alive at night. It's such a different vibe from the daytime. That second picture up there? Yeah, some turdy kids were playing near me and shaking the hand rail for sooo long that I finally gave up. It was freezing cold out there and I was tired of waiting for them to stop being jerks. I guess that's another shot for the "next time" list.